Hi again, New Look, New Start. 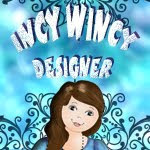 The design members over at Incywincy Designs have given me a new start to create. I took some time off to build website for the charity and create many images and other ideas to sell in our new shop. The charity has taken a lot of my personal time and I have to say it is only going to get more hectic in the coming months. I will be doing my best to create the card standard that I wish to sell at our stalls. This will be hard with the standard of the donations we have received from many of you who I haven't thanked as of yet. Coming Soon I promise. I also have been very busy trying to get mylife in order. Since being put on the out of order rack I have not found what i want to do and I am hoping this is the way. I will try to enter challenges and will be blog viewing leaving messages when possible. Thank you for the ones who stayed on as followers and please relise I deleted all my posts for a fresh start.